Chavriata is a village in peninsula of Palliki in western Kefalonia. 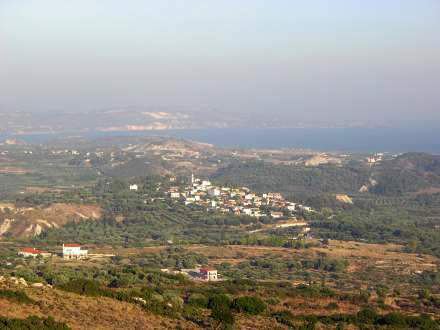 It is built to the south of the area, on a hill at an altitude of just 83 meters from the sea. However, it has panoramic view to Palliki and Ionian Sea, such that some consider Chavriata “the balcony of the Ionian”. In the village, live permanently 220 residents, dealing mainly with the land. The church of Panagia Chavriata is estimated to be built in 16th century and is considered an important monument of post-Byzantine era. It is covered with exquisite paintings inside while the carved iconostasis is a masterpiece of religious art. The Teacher of the Nation Damodos Vincent was born in Chavriata. The Community Library of the village is its name. From Chavriata, he was descended and lived many years of his life in the 19th and early 20th century and the author Elias Tsitselis, the creator of “Composite from Kefalonia”. Just outside the village, in orange, lemon and pine trees is preserved until today the villa where he lived and now is kept his record.